Crime Stoppers offers Android App for anonymous tips | Crime Stoppers of the Lowcountry: 554-1111 | 1-888-CRIME-SC | Anonymous tips earn cash rewards with Crime Stoppers of the Lowcountry. 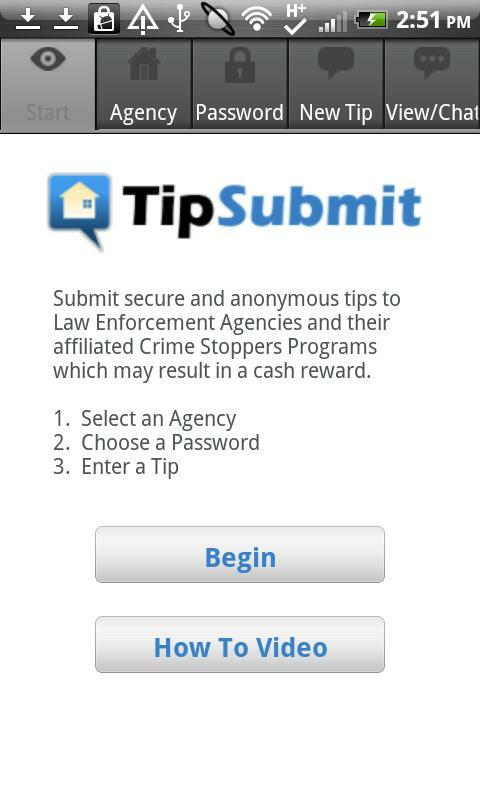 CHARLESTON, SC - Crime Stoppers of the Lowcountry is pleased to announce the release of our new TipSubmit Mobile application for the ANDROID. The new app is free and can be downloaded by visiting the Android Market and searching for TipSoft or TipSubmit. The new software tool is the first anonymous and fully featured crime tipping mobile application. The new app offers great new features and benefits not available with any existing tip submission processes, including the ability to submit images and video, unlimited messaging length, fully anonymous two-way dialogue and even virtual chat mode when both parties are online. While there's still a place for SMS text tips, our new TipSubmit Mobile application takes things to the next level of effectiveness and efficiency. You can visit www.tipsoft.com for a demo video and feature sheet illustrating the benefits offered by this new app – including some exciting new campus-tipping features. We foresee the mobile app could become the leading source of tips within 18 months. There is no additional fee for this application. Download the app here at the Android Marketplace.